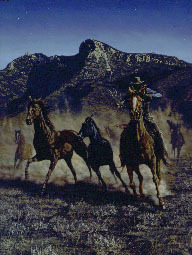 "GOOD HORSES - BAD OMEN"
In the spring of 1892, a gang of outlaws under the leadership of the notorious Jack Bliss, rustled over three hundred head of Army remount horses from the ranch of John Chapman, which is located near Heart Mountain in the Northern Big Horn Basin of Wyoming. This bold act of thievery ignited an all out man hunt for rustlers in the area, culminating in the death or imprisonment of many a rustler and ushering in a more peaceful time in this part of the West. Exclusive issue of only 250 signed and numbered artist's prints at only $175.00 each. Image size - 16" X 20".